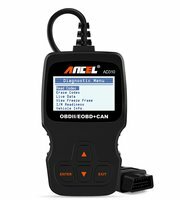 Works on MOST 1996 US-Based, 2000 EU-Based and Asian cars, and newer OBD II & CAN domestic or import vehicles. Supports English, German, French, Spanish, Finnish, Dutch, Russian and Portuguese. Easily determines the cause of the check engine light. I/M monitor readiness test, turn off the MIL (check engine light) as well as view freeze frame data. Read hard (memory) / pending (intermittent) and historic codes and show definitions. The AD310 scanner is well built with a large LCD display (128 x 64 pixel) that has white backlight and contrast adjustment, indicates test results directly. No need any Batteries or Charger, gets the power directly from the OBDII Data Link Connector in your vehicle. It's equipped with a 2.5 feet long cable and made of a very thick flexible insulator. There are 4 buttons on AD310, The up/down button for scrolling the menu. The Enter and Exit button allow for navigation back and entering menu. Three Years Warranty Guarantee.